Tom and Hal, and those dropping by later! Just got back from a four week cruise around the Baltic and then across the Atlantic. We saw really interesting sights and had a great time. It poured last night, but, we seem to be getting a break in the rain today. I'm grateful for that. I'm going out to lunch in a while. It's a restaurant I've never been to. I have directions and my GPS, but, I'd rather not drive to an unfamiliar place in the rain! I will admit that my sense of direction is not the best, so, being able to see clearly is always a plus. Hope your day is filled with sunshine, too! Everybody!! Wolf, sounds great. I'm jealous! Thank you, Shiela!!! Here's flying your way!!! I dedicate this post to Queen Anne!!! Good Maen, good people. I didn't find a straight solve pattern for today's Easy. I tried odds down evens up and even though 3 and 1 left a few holes it was a fast solve nevertheless. 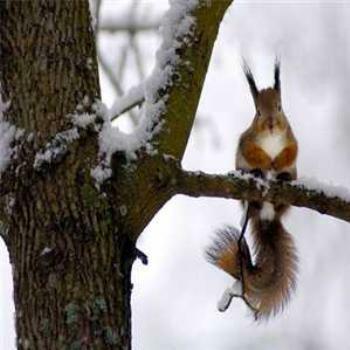 Cute squirrel! Some of us are probably going to be in his condition in a couple of months! How very true, Shiela … not looking forward to such conditions either!! Very cute photo! His ears tell it all! Morning all,cute photo but the caption made me laugh. Raining here too, what we call Scottish mist. Mr Cee,hope your day is full of sunshine. As usual this Saturday’s poozle is a 3&4 poozle, I will work through the alphabet giving you the third and fourth letters of a word and a clue as to what the word is. Mr Cee aka Wazza, have a great day. 1:50 Good morning one and all! Funny photo and caption. Mr Cee and welcome back Wolf! Wolf - sounds as if you had a 'swell' time? Pikers - 43 degrees is the forecast temp tomorrow morning when I will be setting up a display at an art fair. Last year it was 90+ degrees the last weekend in September and we had to set up indoors in the AC! ... after this cp and by the way I'm actually drinking a cheap beer for my 33. A Busch leftover from a kiln firing last weekend that someone left behind and Burl wasn't in the mood to drink. It tasted good with my late dinner of roast beef and muenster rolls. Good maeN, good people. Hi and good morning to you all! It has been such a long time since I dropped in for a visit that I feel ashame! And more! Love you all ! Good to see you put in an appearance, Orianne.